When you learn how to be a doula, you learn about the different types of birth, the stats that surround each one and the benefits of each. Every year in the U.S., over 80% of women have an epidural during labor and over 30% of women give birth via cesarean. Another option for delivery that some women choose is for a natural, or unmedicated, birth. Because most women have pain medication, new moms usually don’t remember that natural birth is an option. But, there are hidden benefits of a natural birth that you should be aware of when considering how you want your birthing experience to go. When epidurals and other pain relief methods are used during labor and delivery, they often interfere with the body’s natural way of laboring, resulting in slower contractions. Additionally, when the pain medications take effect, many women are no longer able to feel their contractions, therefore, they don’t know when it is time to push. By not pushing at key times with adequate strength, the laboring process can be prolonged. A natural birth allows women to work with the rhythm of their bodies, resulting in a shorter labor. Babies that are born via a natural birth tend to be more alert and have a heightened interest in breastfeeding. What most women don’t realize is that the pain medication that they are given to help with the contractions is passed on to their babies, which can impact breastfeeding. 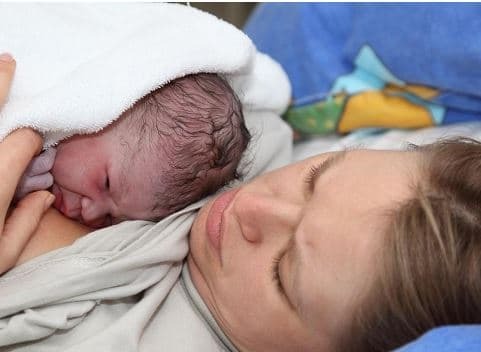 Women who have a natural childbirth will often feel great shortly after delivery. This is due impart to the fact that no numbing drugs were used and no needles were stuck into their bodies. Mothers who go through a natural birth are able to get up, walk around, and shower shortly after birth if they desire. During labor, the body releases endorphins which act as calming and pain-relieving hormones. Women who have a natural birth will release more endorphins than women who utilize pain medication. When no drugs are used during labor, mothers are more alert and aware of the experience, providing them with an increased connection with their baby. Additionally, these women are connected to their bodies in a profound way. When medications are used, a women’s senses are dulled which can result in a physical detachment from the experience. Women who go through childbirth without the assistance of medication, experience feelings of empowerment and confidence. The ability to give birth naturally and conquer the harsh demands of labor often causes women to feel stronger and less fearful about facing other challenges in life. Giving birth and being part of the birthing experience is an unforgettable experience. As a part of your course study on how to be a doula, you’ll not only learn about the different types of birth, you’ll also get to experience live births in-person.